1. Provably false assumption that human activities can influence global climate for which there is no scientifically believable evidence. 2. Provably false assumption that the increases in global temperatures are the cause of climatic changes. Multiyear variations in global climate are driven by variations in the receipt and poleward redistribution of solar energy via the atmospheric and oceanic processes, not temperature variations. This is high school physics. 3. Complete lack of numeracy skills and logical deductions by the climate change adherents. 4. Deliberate manipulation of climate change science to suit political objectives. The conference opened with a Sunday evening dinner at which Canadian statistical analyst Stephen McIntyre presented a meticulous history of the hugely influential “hockey stick” graph — which found an alarming rise of global temperatures since 1979 and led to the IPPC conclusion that AGW is causing a global crisis that requires drastic measures. McIntyre had begun publicly questioning the data several years ago, setting off an effort which ultimately led to the recent Climategate scandal, in which it was shown that the people behind the hockey stick graph knowingly altered the temperature record in a way that expanded a relatively common global temperature change into a shocking heat spike. The scientists’ own words show them as phonying up temperature data “in order to trick you,” as McIntyre noted repeatedly in his presentation, quoting comedian Jon Stewart’s scathing mockery of the alarmists’ attempted evasions. McIntyre quoted extensively from the various parties that perpetrated this massive fraud, but he avoided using such emotionally charged words. Fellow keynote speaker Harrison Schmitt — a Ph.D. scientist and former NASA astronaut — by contrast, embraced the characterization of the Climategate events as a fraud, in response to audience comments in a lively Q&A session after McIntyre’s speech. The questioners strongly criticized McIntyre’s reticence and his argument supporting a central role for government in pressing a climate agenda. What is a multi-multi-millionaire Nobel Prize winner and environmental super-crusader to do with the riches that keep piling up from his international mission to save the planet? If you’re Al Gore, you spend a chunk of it on yet another mega-home, this one in Montecito, California, a pleasant community for really, really rich people along the Pacific Coast near Santa Barbara. This makes four mega-homes for the Gores, who have made vast amounts of money urging people to reduce the amount of energy they consume. It’s safe to say approximately everyone in the world (give or take a plutocrat) has fewer mega-homes and uses less energy than the Gores. Nine bathrooms? Is that because it’s so far from one end of the house to the other that Mr. Gore’s bladder can’t hold out? And six fireplaces: because in California, unlike, say, Canada, it gets cold in the winter, and the Gore’s need six fireplaces. Five wouldn’t be enough. Plus fountains. You can’t have enough fountains, especially as they consume no energy at all. The water just spouts into the air of its own volition. Much has been written over recent months about the enigmatic Chairman of the Intergovernmental Panel on Climate Change, (IPCC), Dr Rajendra K Pachauri. He has been labeled a crook and a fraudster by some, because of his extensive interests in companies that stand to benefit from carbon trading, but those searching for direct and actionable evidence of wrong-doing will be disappointed. 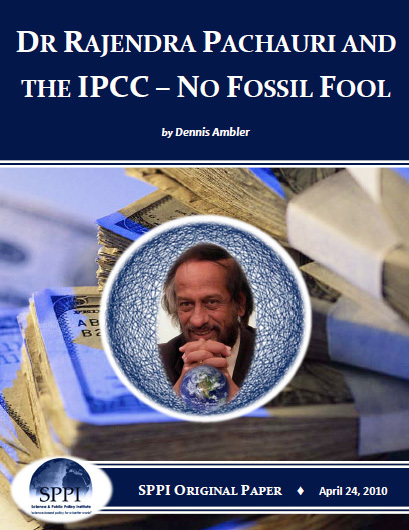 What they will find is someone who has used his position as IPCC Chairman to attract major funding to his own organization, The Energy and Resources Institute2 (TERI), known previously (and concurrently by some), as the Tata Energy Research Institute. The Royal Australian and New Zealand Collage of Psychiatrists’ Congress at SkyCity Convention Centre in Auckland brings together mental health experts in a diverse range of areas; from children and adolescents to old age, mental health across the lifespan will be discussed. Here are some highlights from this morning’s program. Cap-And-Trade: While senators froth over Goldman Sachs and derivatives, a climate trading scheme being run out of the Chicago Climate Exchange would make Bernie Madoff blush. Its trail leads to the White House. Lost in the recent headlines was Al Gore’s appearance Monday in Denver at the annual meeting of the Council of Foundations, an association of the nation’s philanthropic leaders.